A city full of closed doors and dead ends, boxed in and lined with nothing but rough edges: That's Thief. It's hard to know quite where to begin with a shambling mediocrity such as this. It's a game that could have been great and is instead a lumpy, frumpy disappointment, outclassed on all sides by its contemporaries and struggling mightily for a foothold in a world that's moved on to better things. Thief is the long-awaited fourth entry in the storied Thief series. Its predecessors, particularly 1998's Thief: The Dark Project and 2000's Thief II: The Metal Age, are often credited with revolutionizing if not flat-out inventing a particular genre of immersive stealth game. Like those forebears, Thief is a first-person adventure game that casts you in the role of a larcenous leather-wearer named Garrett, a legendary thief who prefers to stick to the shadows, grab the loot, and avoid being seen whenever possible. There is perhaps no better encapsulation of Thief than its setting, a perpetually nocturnal steampunk mega-shantytown known as The City. This place appears fascinating at first glance. It's a malignant growth of houses built up on other houses, a busted Rubik's Cube of angled alleyways and dark, hidden corners. An eager player might be champing at the bit to start exploring, but reality is far less exciting than it may have seemed at first blush. The City is obstinate and confusingly designed, and its sprawl is mostly an illusion. What initially looked free and open is revealed to be locked in irons, little more than a collection of cramped corridors stacked on top of one another and placed between you and your next objective. Story missions and sidequests are all isolated, and each one is separated from The City's streets by at least one loading screen. (Thief has so, so many loading screens.) It's all fragmented and immensely difficult to navigate—Garrett can climb some walls but not others, scale some fences but not others, open some doors but not others. His bow and arrow theoretically offer some means of manipulating the environment, but even that has been hobbled when compared with past games. In particular, the rope-attached arrows that allowed for such creative exploration in past Thief games now can only be attached to a scant handful of designated rope-points. The City has more dead-ends than it has escape routes. It's constantly patrolled by dangerous guards, but if they spot you, whatever chase ensues will likely be brief, ending either with Garrett cornered or with the player taking advantage of one of several ridiculous ways to exploit enemies' shonky artificial intelligence. For example, you can begin to jimmy open a window and guards will immediately stop chasing you, even if they were right on your heels. Curses, he got away! Thief absolutely loves to shut doors. At almost every opportunity, the game closes itself behind you, sealing off Garrett's path of escape and pushing him ever forward. When Garrett goes through a window, the window automatically closes behind him. When he finds a secret passageway or unscrews a gate leading to a ventilation duct, the openings swing shut as he passes through. Thief is a series of gates, each one spring-loaded to close as quickly as possible. It's a subtle thing, but constant, and it has a distressing effect over time. While it's usually possible to go back through the door or window that just closed, all that endless, unceremonious shutting leaves the game feeling unpleasantly fragmented. As the hours pass, Thief becomes a claustrophobic, constipated experience, a collection of coffins glued together into a superstructure that's all the more difficult to navigate for its blown-out size. Gah. Thief's map is a perverse achievement in counter-intuitive video-game cartography, a series of white lines and black squares so starkly unhelpful that it sometimes feels malevolent. Exploring The City often feels like attempting to navigate a wheelchair to the top of a great stack of differently-sized crates. Immersive sims like the original Thief games have historically consisted of complex levels that, at their best, operate like great whirring mechanisms. The stealthy player exists at the periphery, and without his or her interference, the machine simply continues to spin and grind. It's up to the player to decide how to poke and prod at the machine, or whether to slip through the gears so expertly that the mechanism never even registers an outside presence. At times, I caught glimpses of the good game that might have been. Things start out promisingly, as Garrett follows his young protégé Erin on a breathless race across the rooftops of The City. You run by holding down the left trigger, which much like an Assassin's Creed game prompts Garrett to automatically climb, mantle and leap from wall to window to rooftop. There at the beginning, I felt like I was catching sight of what Thief should have been—a first-person Assassin's Creed-meets-Mirror's Edge stealth game, all leaping and diving from rooftop to rooftop, flitting through the shadows like a panther set free. I wish I'd gotten to play that game. Alas, it's a proof-of-concept that's never repeated, and The City's rooftops never feel that open again. For all my gripes about the main story missions, there were several smaller instances—usually during one of the many small side-missions or medium-sized "client" missions—during which I found myself plenty engrossed. Creep through the house, locate the hidden safe, grab the loot and make it out undetected. Cool. I'll allow that I simply like sneaking, and that no matter how messy or unpolished the full game may be, I'll never fully tire of extinguishing torches and outwitting guards. If all you want is to sneak through a seemingly endless parade of small areas while outmaneuvering dimwitted guards, Thief has got you covered. Its side-missions may be middling, but there sure are a lot of them. From a technical standpoint, Thief is remarkably rickety, at times downright shoddy. I haven't played a big-budget game this unpolished in a while, and was eventually reduced to rueful laughs every time something appalling would happen. Guard AI would frequently bug out, strange music and ambient audio would cut in and out in unexpected places, alerted enemies would carry their alertness over after I reloaded a quicksave instead of resetting (! ), ambient dialogue would get stuck in a loop during cutscenes, and end-level screens would jarringly interrupt characters mid-sentence. That is, guards that don't hear you making a racket, don't notice you kicking a rake directly in front of them, and then proceed to get trapped in a bugged, looping cigarette-lighting animation. Yeesh. I played a mostly complete pre-release build of the PC version of Thief, and I have to assume—or at least hope—that some of the more obvious bugs will be ironed out by or shortly after launch. (For example, at every mission-completion screen, my display would recast itself in a 4:3 aspect ratio, often forcing a complete restart to return to 16:9.) Even assuming the most egregious bugs are fixed, Thief will still feel like a hurriedly finalized first draft. The left-trigger free-running could've made up for the lack of a jump button, but because the environments are so inconsistent and often insurmountable, Garrett mostly winds up grounded, scooting around with his hands outstretched like a hunchbacked Bela Lugosi. PC purists can forget about the complex mouse and keyboard controls of past Thief games—for the most part, the PC controls mirror the controller. There isn't even a free-standing lean option. Unthinkable! Thief technically offers the option to engage enemies in one-on-one combat, but the first-person fighting is so awkward that it's best avoided entirely. Put it this way: On a controller, the left shoulder button is used to dodge and the right shoulder button is used to attack. Yes, combat in this game is handled with the shoulder buttons. 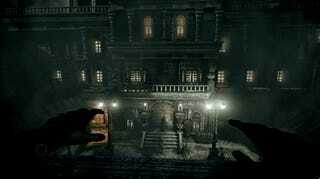 While many games of this type will gradually introduce new enemies, slowly increasing the number of variables in order to keep players on their toes, Thief rejects variety completely. Aside from some CHUDs that make an inexplicable cameo appearance for part of a level, there are essentially two enemy types in the entire game. They're a pair of gentlemen I have come to affectionately think of as Swordbro and Crossbro. Garrett's enemies change as the story progresses, but whether the narrative claims the guards are men of the City Watch or deadly rebels set on killing anyone they see, it's really always just Swordbro and Crossbro. Imagine: An entire city of Swordbros and Crossbros, all doing the best they can, trying on hats in their downtime. As they go about their patrols, guards repeat the same few lines of dialogue to the point of inadvertent self-parody. Thief contains a very small amount of overheard guard dialogue, yet many of those lines have been recorded multiple times and attached to different guards in different areas. You might be surprised at how many different ways there are to say "You can smell the river from here." "You can SMELL the river from here," says one guard, surprised that you can do more than taste and feel it. "You can smell the RIVER from here," muses another, later, apparently impressed that of all the things you can smell from here, the river is one of them. "You can smell the river from HERE," mutters a third, reflecting on the fact that the river can be smelled even from this great distance. I heard this line of dialogue in just about every area in the game; apparently you can smell the river from pretty much anywhere. 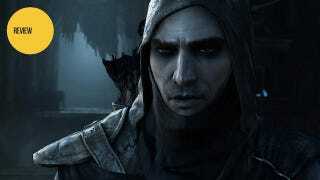 Version Check: Thief is coming out on five platforms: The PC, PS4, PS3, Xbox One and Xbox 360. I played the game all the way through on PC and also tested the PS4 and Xbox One versions. The PC version is easily the superior option; it looks quite nice, and I was able to run at very high settings at 1080p and maintain a mostly solid 60fps frame rate. Both next-gen console versions run at around 30fps, though both feel a touch inconsistent. The PS4 version runs at a slightly higher resolution than the Xbox One version—1080p to the Xbox One's 900p—but neither looks or runs as well as the PC version. While I could spot the resolution difference when comparing the two next-gen versions, both are a bit crusty and don't feel like they show off the full potential of their respective consoles. 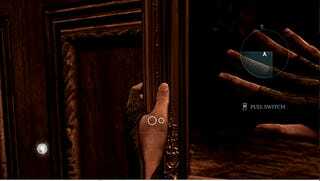 As for unique console features, the PS4 version needlessly ties the inventory to the DualShock 4's touchpad, which is less intuitive than the radial menu in the other versions. The Xbox One has some typically useless voice functionality and uses trigger-rumble while lockpicking in a nifty way. I was unable to get either a PS3 or Xbox 360 version of the game to review ahead of the release date, so I can't yet speak to their quality. Thief's narrative revolves around the perplexing and underdeveloped relationship between Garrett and Erin, as well as a strange sickness called "The Gloom," a bout of amnesia, a mysterious power called "The Primal," and a handful of empty-shirt supporting characters who occasionally waltz onstage to say things like "We're not so different, you and I." Like so many aspects of the game, the story barely holds together right up until it falls apart completely. This narrative glue is more like dried chewing gum, an attempt to spackle together disparate story missions with napkin-thin characters and cliché-ridden dialogue, all building up to a finale so unsatisfying and nonsensical that even now I remain unsure what the hell happened. When the credits rolled and I saw well-regarded writer Rhianna Pratchett's name atop the writing credits, I did a double-take. Pratchett, who wrote last year's Tomb Raider, is by all accounts a skilled writer, as well as being a fierce advocate for more diverse, interesting video-game scripts and better roles for female characters. Yet here we have a game with one of the clumsiest, most poorly constructed stories I've encountered in recent memory, where the only notable female characters are A) a dull "bad girl" who quickly becomes a damsel in distress B) a mystical exposition-crone and C) a group of prostitutes. The disconnect between Pratchett's talent and the contents of the game's script may be indicative of what went wrong with Thief more broadly. I've no doubt the majority of the people who worked on the rest of the game were similarly good at what they do—these are some of the same people who made the terrific Deus Ex: Human Revolution, after all—but their combined skills still don't appear to have been enough. We've long been hearing rumors and reports of Thief's extended, torturous development, tales of scrapped ideas and a work environment derailed by office politics, where leadership was constantly in flux and creative direction was inconsistent at best. Over the course of the game's story, it's revealed that for generations The City has been ceaselessly built and rebuilt on the skeletons of past cities, with powerful men and women fighting for control as their workers suffered in the gloom. Critic Leigh Alexander once smartly observed that games often reflect the environments in which they were created, and that observation feels particularly relevant here. We often use the word "release" to talk about new games. I've never been fond of the term, but in this case it feels fitting: Thief has been released. Thoroughly mediocre though the finished product may be, it is perhaps a relief that after years in creative purgatory, it has finally been set free. May its better ideas go on to fuel other, better games. For now, though: Thief is a woeful disappointment, a bowl of stealth gruel best pushed aside in favor of tastier fare. Let it sit, let it grow cold, and let it be rinsed away.